It’s Christmas Eve, if you’re Russian Orthodox, and Christmas Day if you’re Armenian Orthodox. As the burning thermonuclear eye of God itself dipped behind New Jersey, whilst on my way to that Holiday party in Hells Kitchen I’ve been talking about all week, I was reminded of something about myself. I’m lucky. Despite the objectionable nature of my personality, the disgusting personal habits I readily display, my sloth, bizarre opinions loudly repeated, and everything else which causes those who know me to curl their upper lips up in disgust – I’m lucky. I also need to get out more often. 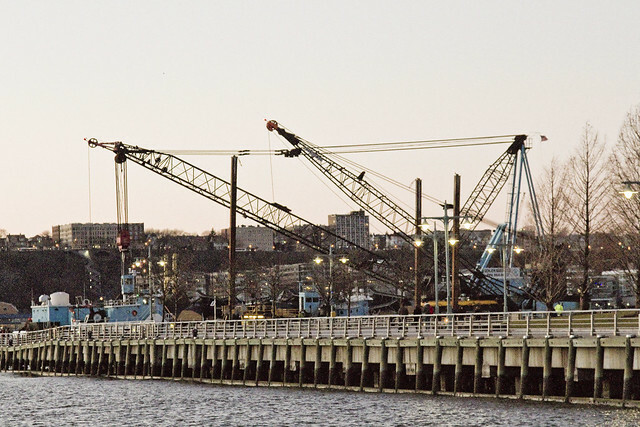 As I was passing by the Circle Line at 42nd street and found myself approaching Pier 84, I noticed a series of maritime cranes and tugs at work. 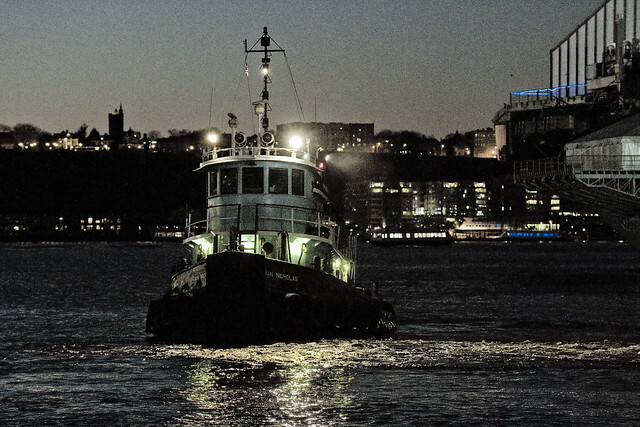 It was DonJon towing doing the work – the Sarah Ann and Brian Nicholas tugs were quite busy. 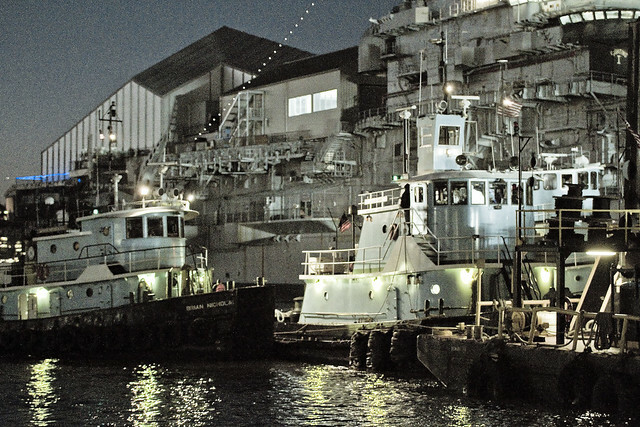 You don’t get to see much maritime industrial stuff going on at the Hudson River coastline of Manhattan, in this century at least. 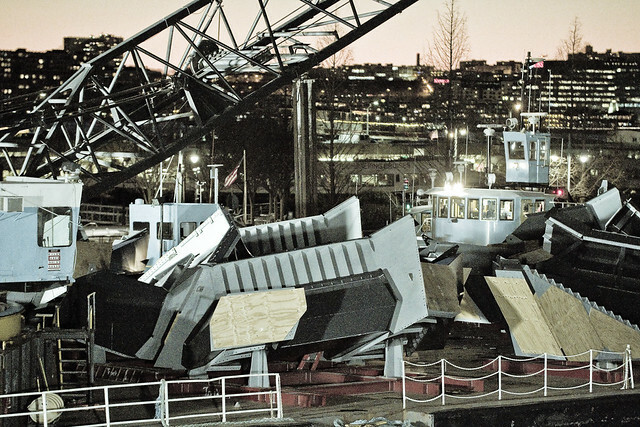 The DonJon tugs were “wrassling” two barges into place, one carried a maritime crane, the other was full of what I originally perceived as being scrap. Couldn’t have been more wrong, as it turned out. 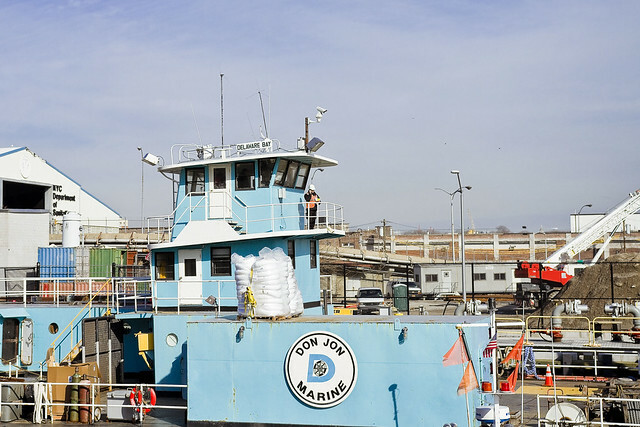 Longtime readers of this – your Newtown Pentacle – know that I have a certain fascination with the DonJon towing company, who operate regularly on my beloved Newtown Creek. They have wonderful toys, DonJon does. 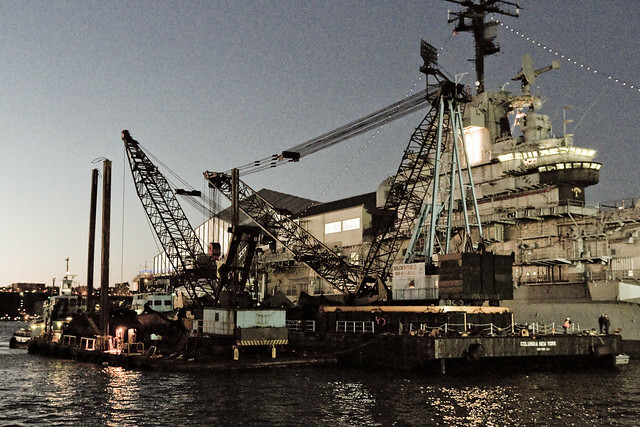 The flat top barge was carrying huge “lomticks” of steel, which conversation with one of many “hard hats” on the pier described as being destined for the Hudson Yards project. Scrap indeed. 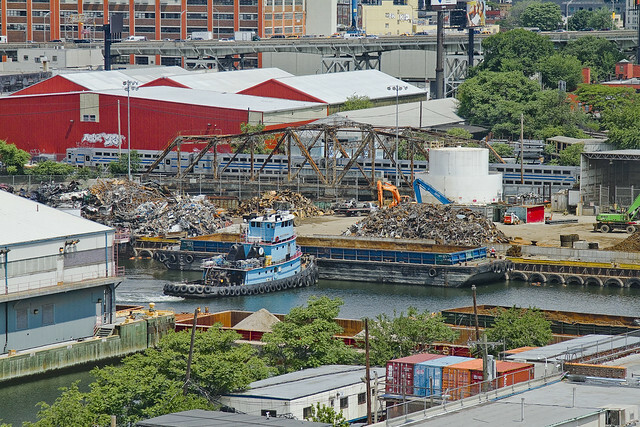 Part of the reason that I originally thought the flat top barge was handling scrap was the significant tonnage of the stuff that I normally observe the DonJon people moving around the harbor. This post from 2012 follows the DonJon Tug Sarah Ann, pictured above, towing metal and employed by the recycling people. 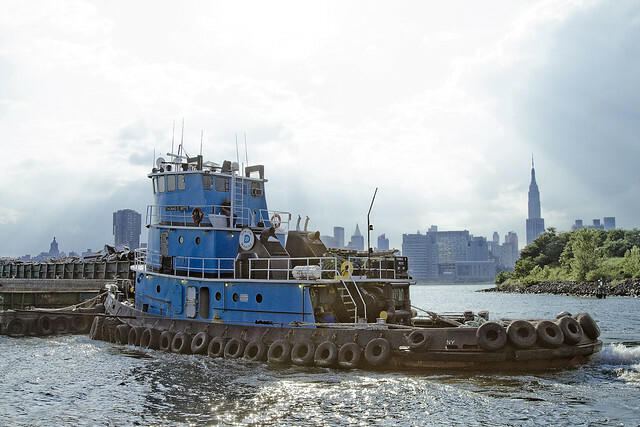 The other DonJon towing vessel on duty was the Brian Nicholas, discussed in another 2012 post, one which also happens to carry one of my all time favorite “tugboat on Newtown Creek” shots. 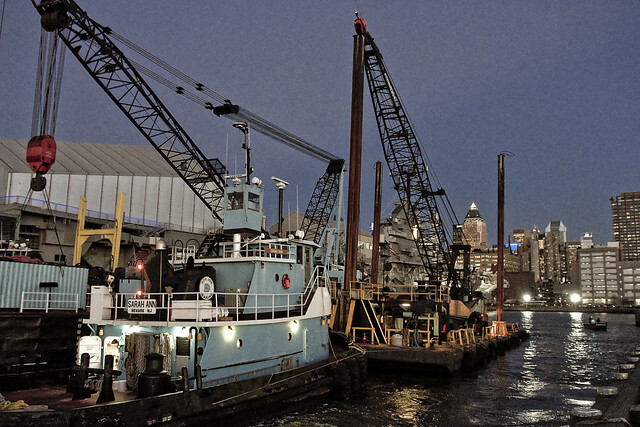 The location which the steel was being delivered to is a fairly narrow channel that’s normally used to launch human powered boats by the Manhattan Kayak club people, adjoins Hudson River Park, and it neighbors the Intrepid Air and Space museum. This location is analogous to the Manhattan street grid as being 44th street. 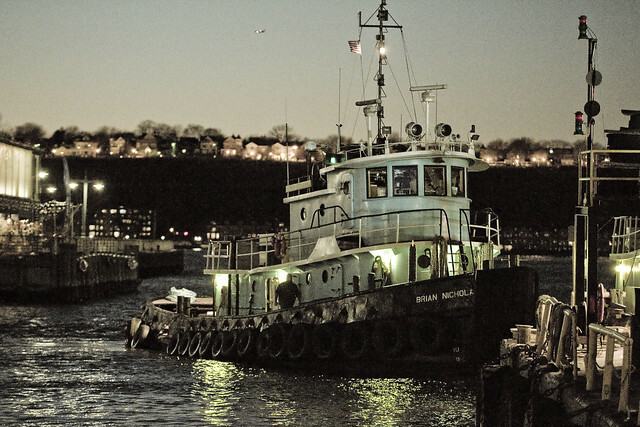 The crane barge is DonJon’s Columbia New York. She’s got a 140 foot long boom, dates back to the 1970’s, and can lift 310 short tons while its base is revolving. Everything you’d care to know about the thing can be found here. 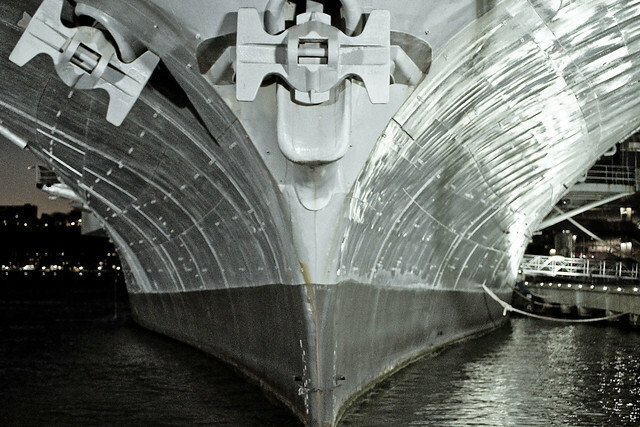 The entire operation slowed down to a crawl as they approached the Manhattan bulkheads. A small workboat was zipping around, and everywhere you looked on the vessels there were sailors peering over the sides communicating on walkie talkies. 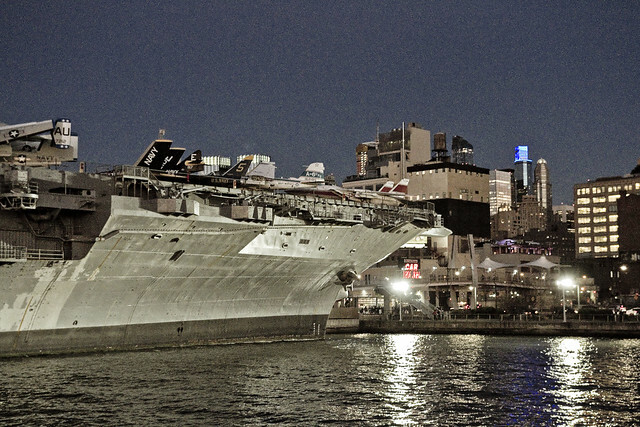 I guess they didn’t want to scratch the Intrepid or something. 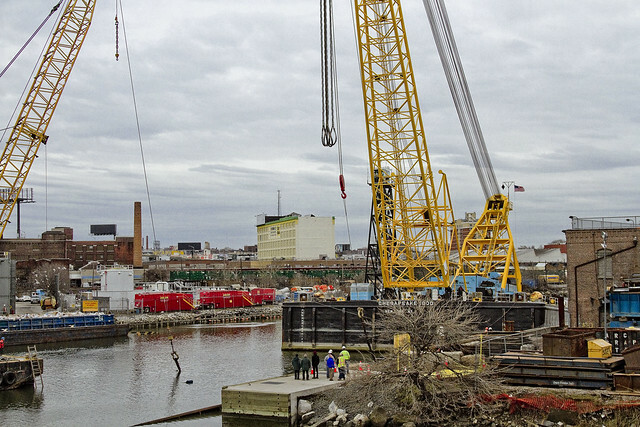 Brian Nicholas hung back as the crane and flat top barges moved into position. The crane barge began lowering its “spuds,” which are long steel bars that extend down to the bottom of the river and act as stabilizers (think table legs). While that was happening, ropes were flung around and tied off to bollards. Having successfully killed the time between leaving Point A (Astoria) and that Holiday party in Hells Kitchen by walking through LIC, taking the 7 to Hudson Yards, checking out the Hudson Yards megaproject from the High Line, and then luckily running into this maritime industrial display – it was actually now time for me to begin heading there directly. Couldn’t resist one or two more shots, however. 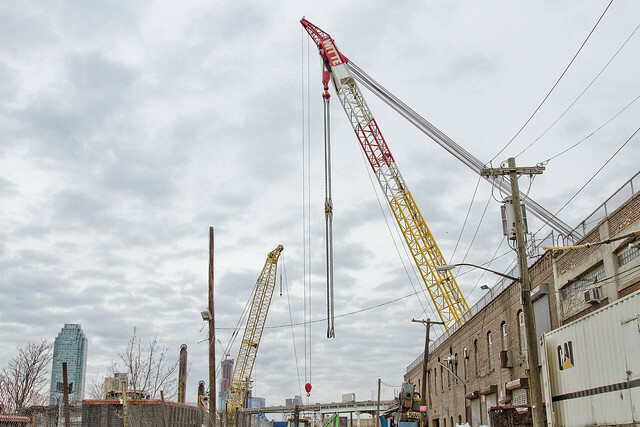 There’s some of the structural steel being delivered to the Hudson Yards project, in a somewhat elevated shot gathered from a pedestrian bridge at West Street between 45 & 46th streets. From the same elevated position, and from a bit of a distance, you can get a better idea of the size of the crane. While all this was going on, rush hour was playing out on West Street. So, that’s the story about all the stuff I saw because I got invited to a holiday party in Hells Kitchen. I should leave the house more often, I guess. See what happened the next time I went out, next week at this – your Newtown Pentacle. Also, Merry Christmas to all you orthodox Russians and Armenians. Sunday the 7th is “Gristmas,” btw, or Greek Orthodox Christmas. 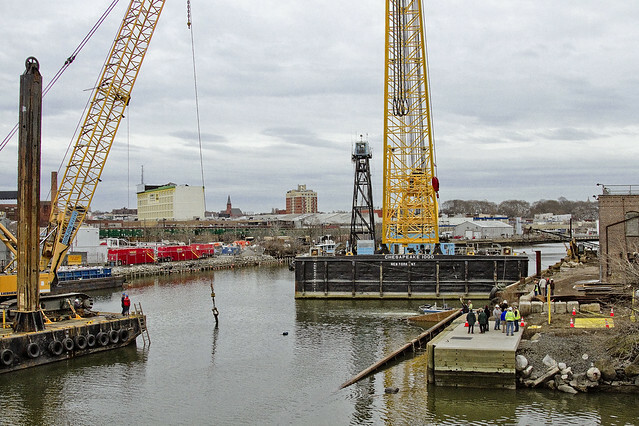 Big doings on my beloved Newtown Creek, in today’s post. Word reached me that a barge had sunk on Newtown Creek last week, at the Allocco Recycling plant in Greenpoint, and despite suffering from a debilitating shoulder injury (Don’t worry, I seem to be on the mend) a humble narrator painfully packed up his kit and headed over to the tripartite intersection of North Henry Street and Kingsland Avenue at Newtown Creek. Allocco Recycling are in the metals and aggregates (or Fill Materials) industries. 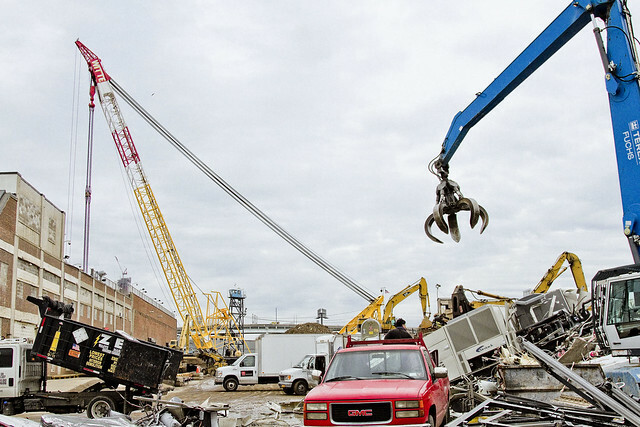 Metals are the usual thing – copper, aluminum, iron recycling and collection. Aggregates involves the seining and separation of rock, stone, sand, and gravel from construction and excavation materials. 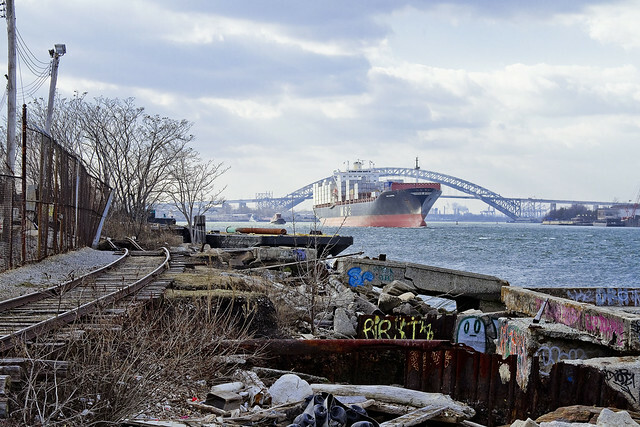 Allocco are good guys, in my book, as they ship their processed materials out of Greenpoint using barges rather than trucks. 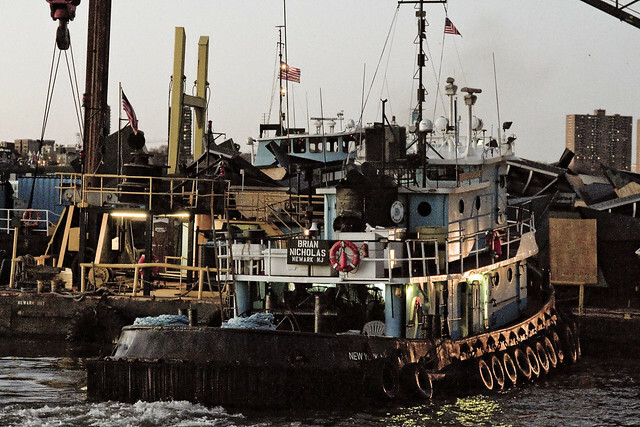 A single barge is the equivalent of 38 heavy trucks. 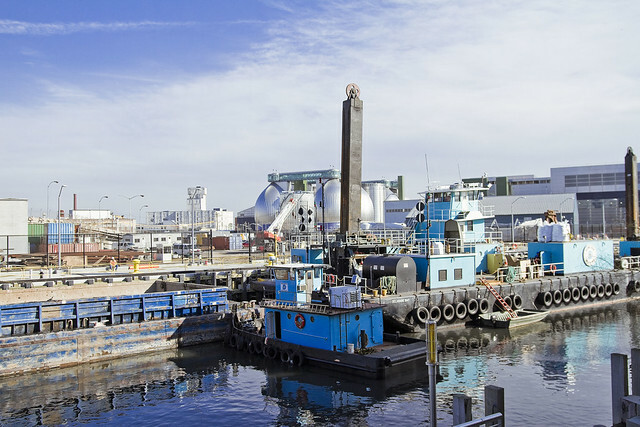 Allocco has a large property that borders on one of Newtown Creek’s minor tributaries – the so called “Unnamed Canal.” Across the street is the Newtown Creek Wastewater Treatment Plant’s employee entrance, and down the block is a biofuel company called Metro Fuel. I’m prejudiced towards both entities, it should be pointed out. The DEP lies to me on a regular basis, so I don’t like them. Metro – whom I do like – on the other hand, was founded by my pal Paul Pullo. Paul is a friend and supporter of Newtown Creek Alliance whom I work with on a number of the NC committees like NCMC and the Newtown Creek CAG. NCA is also working with Allocco on our Living Dock project which is playing out on Unnamed Canal, as well as the “North Henry Street Project” which will be discussed in some detail at an NCA meeting next week. All of my conflicts of interest are laid out in the paragraph above, except for one, which I’ll mention later. Showrunner Mike Allocco, it’s a family owned business after all, told me what happened (and allowed me on the property). It seemed that they were filling a barge with stone on a Friday night and closed shop. 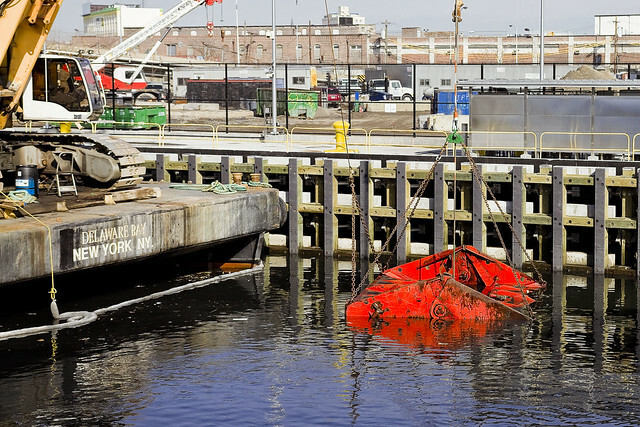 The half filled barge was about one third of the way submerged when they returned to work the next morning. His crew did everything they could to hoist and pump out the barge, but it continued to sink and by Saturday afternoon the barge was in the state you see in the shot above. Allocco then contacted DonJon towing to salvage the thing, and DonJon brought in its heavy equipment. 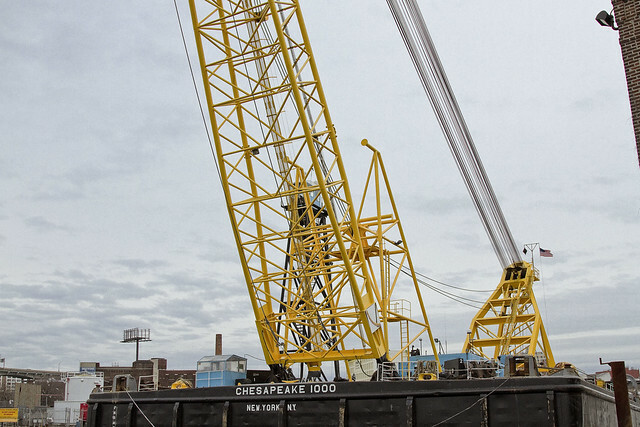 The large maritime crane – which is actually the second largest unit of its type in NY Harbor – is the Chesapeake 1000, and the smaller unit with the crawler crane attached is the Delaware Bay. There were a couple of tugs keeping them in position, but I was unable to identify which boats they were. 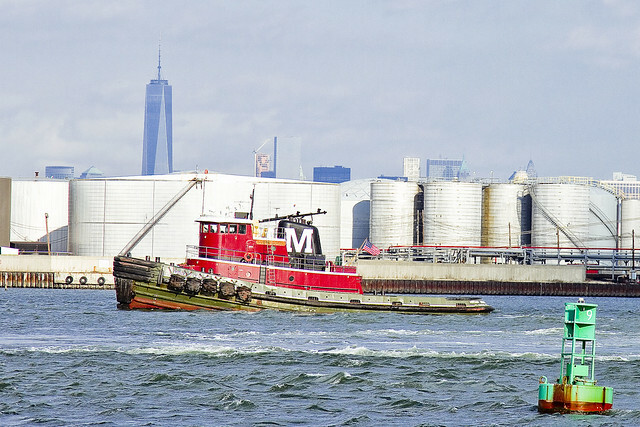 The plan, which has already played out and been accomplished, closed Newtown Creek to maritime traffic for an interval. 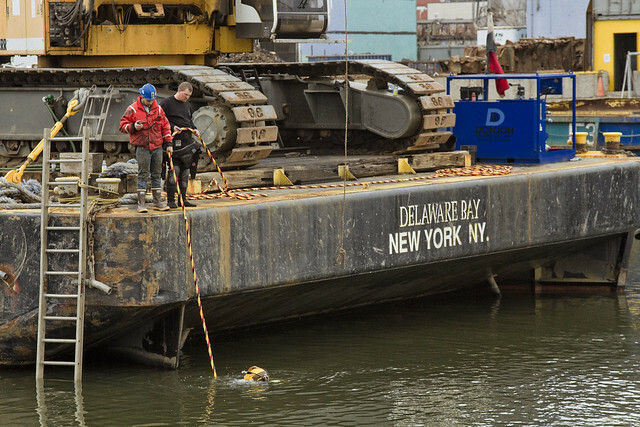 The DonJon crews fed a pair of cables under the sunken barge, lifted it out of the water, pumped out the water, and then moved it into a shallower section of the Allocco bulkhead for repairs. 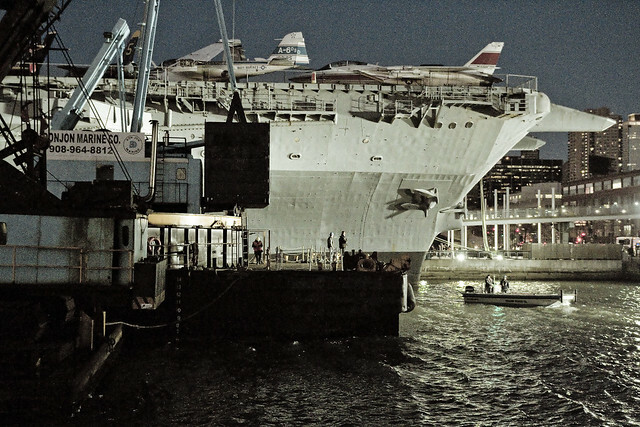 When these shots were gathered, the presumption was that the barge had a damaged hull. For a maritime industrial geek like your humble narrator, seeing the Chesapeake 1000 was a real treat. 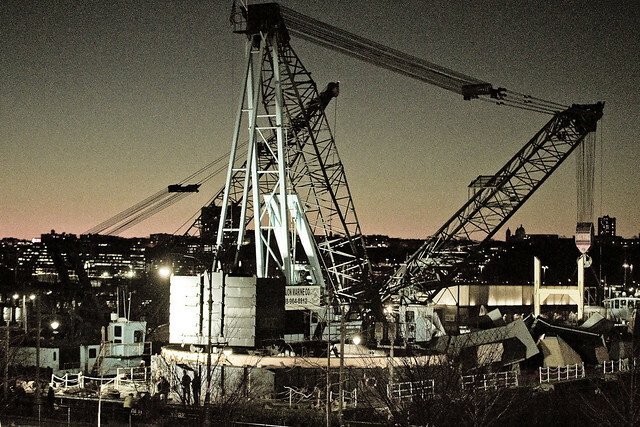 DonJon Towing hosts a page listing all of the technical specifications that this 1972 vintage 2,484 Gross Tonnage crane entails. The “1000” part of its name comes from its lifting capacity, but it used to be known as the Sun 800 before DonJon got it. The Sun 800 was damaged in a storm, and during the repair process it was upgraded and outfitted with the 1,000 ton boom it currently sports. The hard hat guys I chatted with on the shoreline at Allocco related the cranes history to me as we watched the operation. Now, this is where the interesting bit comes in. It seems that the Sun 800/Chesapeake 1000 was originally built by the Howard Hughes corporation to facilitate the Glomar Explorer project. Glomar Explorer was a giant ship built in the early 70’s which the Hughes people told the world was going to be used for the harvesting of ocean floor minerals and specifically manganese nodules. That was a cover story, however, for the true mission of the thing, which was to recover a Soviet submarine which had sunk some three miles down on the floor of the Pacific Ocean for the CIA. The project was called “Project Azorian.” The Chesapeake 1000 is officially an artifact of the height of the Cold War, like the Saturn V rocket. It continually amazes me, the sort of things that Newtown Creek leads to. 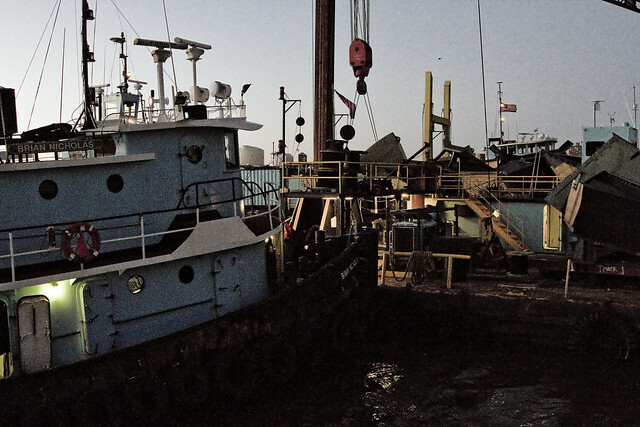 The other DonJon rig on the job was Delaware Bay, which is a clam shell dredge vessel. It’s got 1,250 square feet of deck space and was built in 2006. It’s 225 feet long and 54 feet wide, and 1,205 gross tonnage. 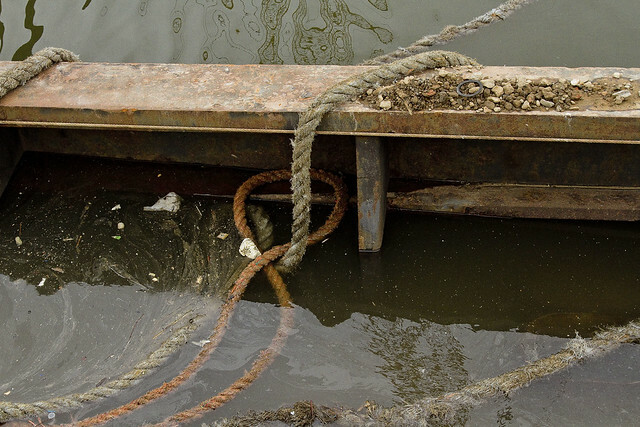 The barge itself is unremarkable, other than the fact that it’s submerged. 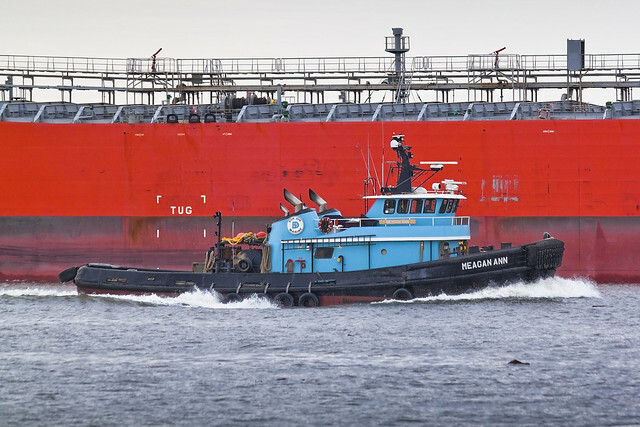 It’s a dry bulk type, and is essentially a giant floating bucket. 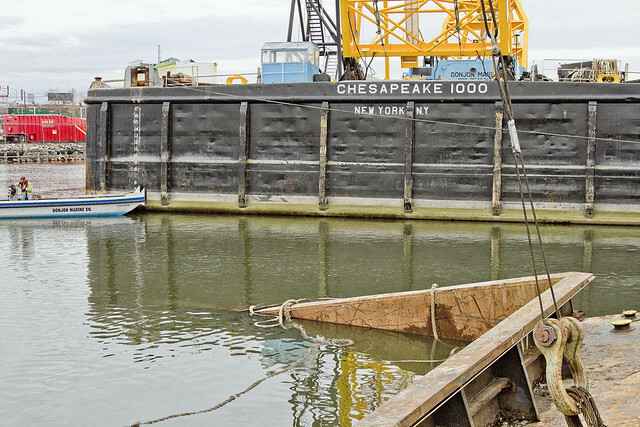 As mentioned above, the crews from DonJon were executing a plan in which a couple of heavy cables would be run under the sunken barge, at which point the Chesapeake 1000 would lift the thing up and out of the Creek and then pump out the water. To this end, there was a dive team operating. 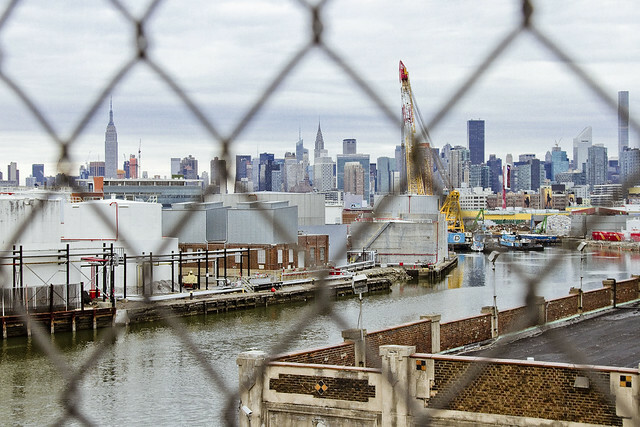 One cannot imagine the horrors of diving into the turbid waters of Newtown Creek, nor the safety precautions that a professional diver would need to undertake in pursuance of the act. 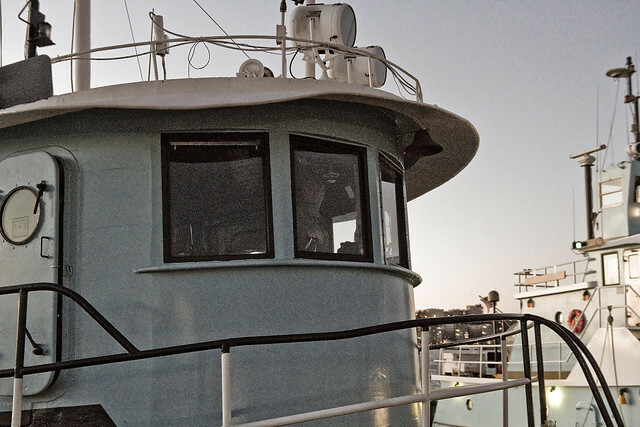 I’ve had the pleasure of chatting with members of this profession who operate in NY Harbor, and they tell me that it’s actually a blind business. Visibility in the waters of NYC is a couple of feet under best case circumstance, but in the East River and its tributaries, you often can’t see your hand six inches from your face mask. They do a lot of their job by feeling around, and relying on their training. 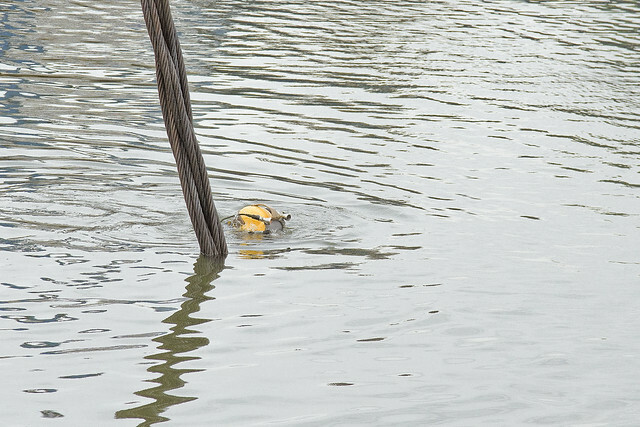 One fellow kept on bobbing up around the cables which were being fed under the sunken barge. 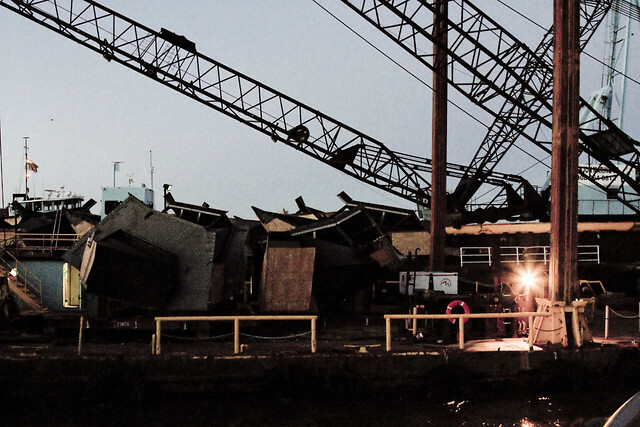 So, that’s the story about the time in February of 2016 that a barge sunk at a recycling company called Allocco in Greenpoint, along the lugubrious Newtown Creek. Maritime Monday? What’s with me these days? Over at my Brownstoner column today, an article detailing a boat trip up Newtown Creek (called “my beloved Creek“) which brought members of the Newtown Creek CAG to the waterway on the 11th of July is described. 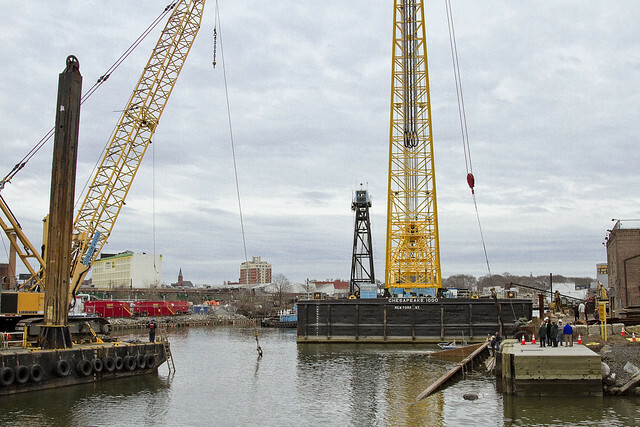 It’s a pretty long read, and describes a site visit and boat excursion which was initiated by the “Newtown Creek Group” who are the “Potentially Responsible Parties” named by the Federal EPA in the Superfund listing of Newtown Creek. 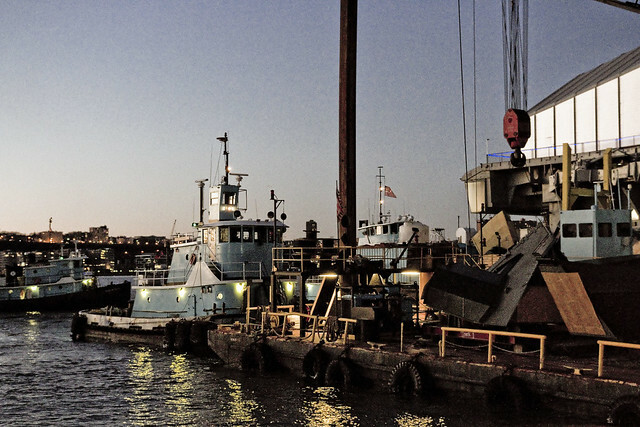 While we were out on the boat, the Thomas D. Witte tug from Donjon towing happened along. 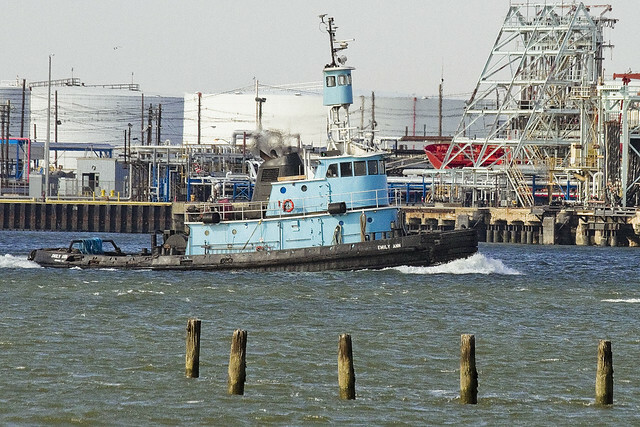 Likely coming from SimsMetal, the tug was engaged in guiding two barges out of Newtown Creek towards the East River. Maritime industrial usage of the Creek wasn’t really a part of the discussion while we were onboard our boat. The PRP and EPA’s contractor, Anchor QEA, had sent out representatives and scientific staff to inform and instruct about their efforts, and the extensive schedule of scientific analyses which they’ve been engaged in for the last few years. They also wanted to discuss the future. 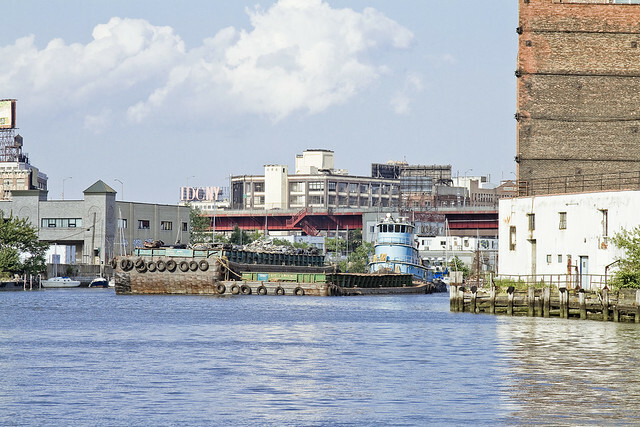 “Once upon a time, the industrial Newtown Creek represented nearly two million jobs spread across its vast watershed, and it carried a greater tonnage of cargo than the entire Mississippi River. 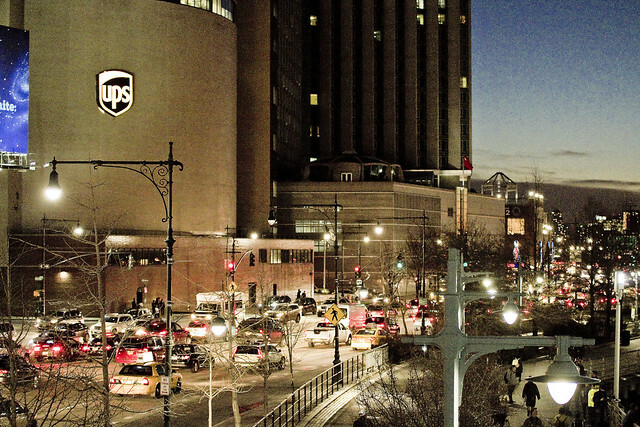 It’s 3.8 miles long, providing the currently undefended border of Brooklyn and Queens, and sits at the dead bang center of New York City. The Newtown Creek CAG summer meeting will be coming up soon. 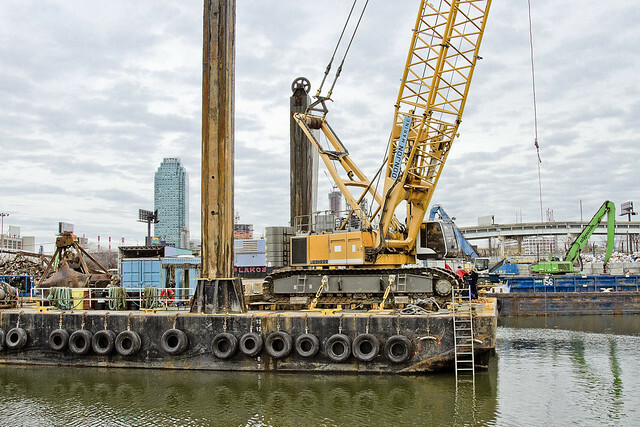 Dredging operations on the Newtown Creek are underway. After a couple of false starts and delayed beginnings, DonJon Towing is finally getting busy over on my beloved Creek. The dredging project is designed to provide a maritime channel for a new class of DEP Sludge Boats (see this Newtown Pentacle post from back in January of this year for details on the new boats) which will use a dock on Whale Creek, rather than the current East river facility, to accept the processed material produced by the Newtown Creek Waste Water Treatment Plant in Greenpoint. 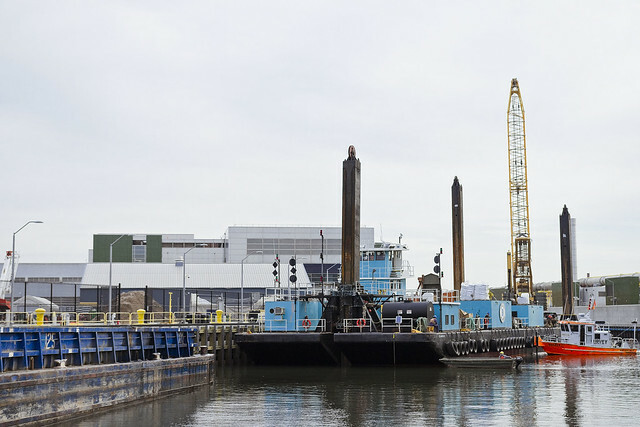 These shots were gathered yesterday, at Whale Creek – a Brooklyn side tributary of Newtown Creek which the sewer plant wraps around. Unfortunately, due to a busy work schedule and weather issues, I only managed to get there late in the afternoon and missed the action. This little push boat was busily managing the barges into a docking position, however. 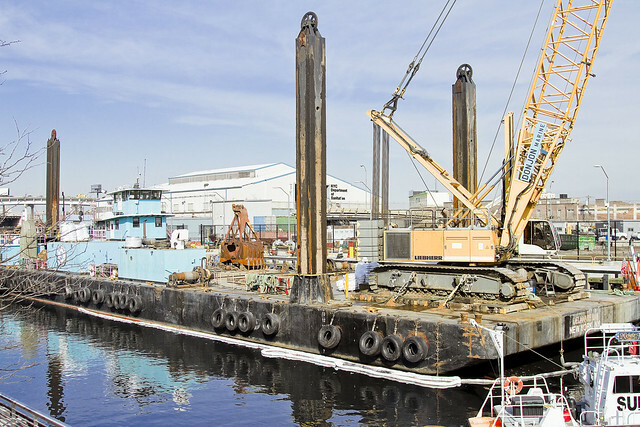 The dredging rig was the Delaware Bay, which is a 225 foot long monster commissioned in 2008, and outfitted with a 123 foot long boom and crane. That’s the actual dredging bucket, which is outfitted with some sort of esoteric gasket system. 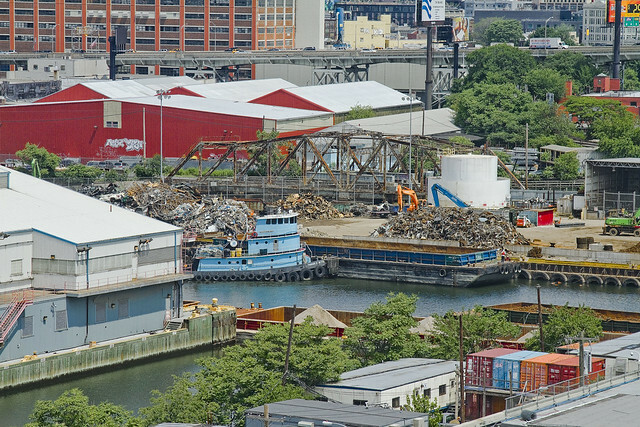 I’ve never felt pity for a big steel machine before, but… Yuck… this is Newtown Creek. The whole operation is meant to continue on for about six weeks. The initial phase of it, here on Whale Creek, will only be operating 12 hours a day, but once they work their way out onto the main body of the Creek – probably Tuesday of next week, they will go 24/7. 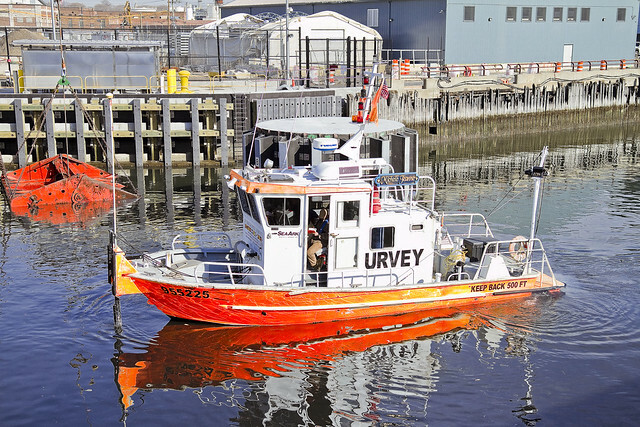 This little Survey boat was buzzing about, and I’m told it carried a battery of sonar equipment which allowed visualization of the dredging work in real time. There’s a lot of stuff down there, pipelines and cables and such, for the DonJon crews to watch out for. A DEP contractor was on hand performing air quality tests and odor control functions. 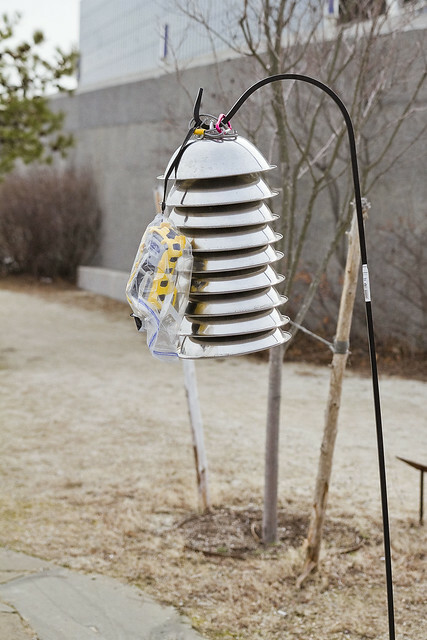 This was his little weather station. 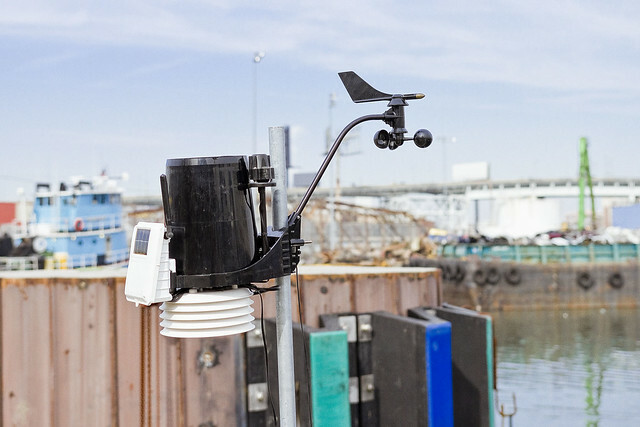 Also part of this contractors kit was a Hydrogen Sulfide monitor, which measures concentrations of the compound released from the underwater sediments during the dredge process. 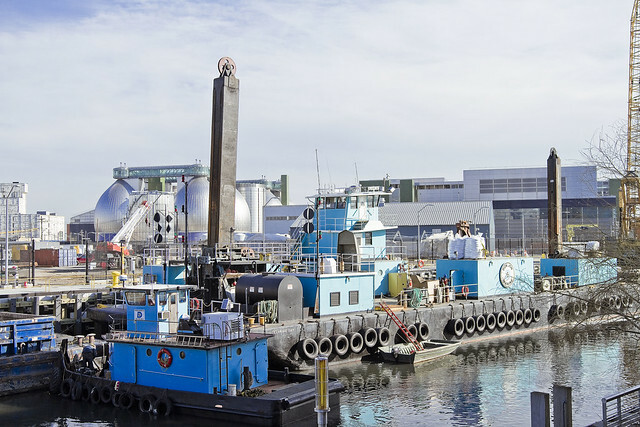 It’s critical, once the operation moves out of Whale Creek and heads west towards the more populated sections of the Creek in Greenpoint and Hunters Point, that you call 311 if you’re being affected by smells or noise. Also, I’ve been told that the NCWWTP Nature Walk will be closed for the weekend, in the name of safety. If you smell something, say something, and call 311. Today’s shot is another from the archives, depicting DonJon’s Meaghan Ann tug maneuvering into the towing position indicated for a fuel tanker, and was captured along the reliable Kill Van Kull. A happy and a healthy Cannibal Holocaust Sunday is offered accordingly. 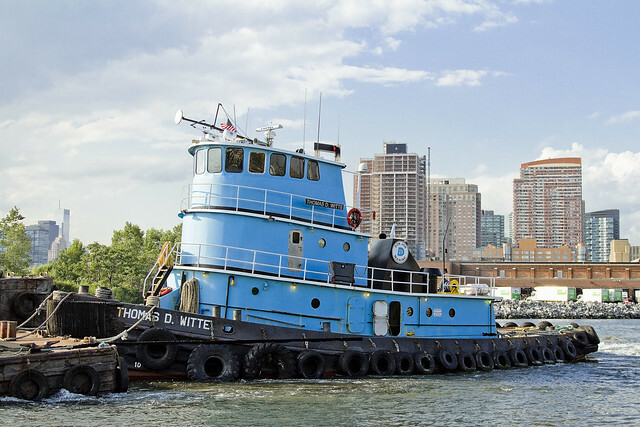 On this Maritime Sunday, witness the struggles of the Thomas D. Witte tug as it manages a barge into place on the lamentable Newtown Creek. That’s the City’s “Newtown Creek Dock”, tenanted by the mill of the titanic SimsMetal operation. In a distant era, this locale was the home of the LIRR’s infamous Manure Dock, where a 30 foot high pile of the stuff would have awaited disposition to agricultural clients further east. 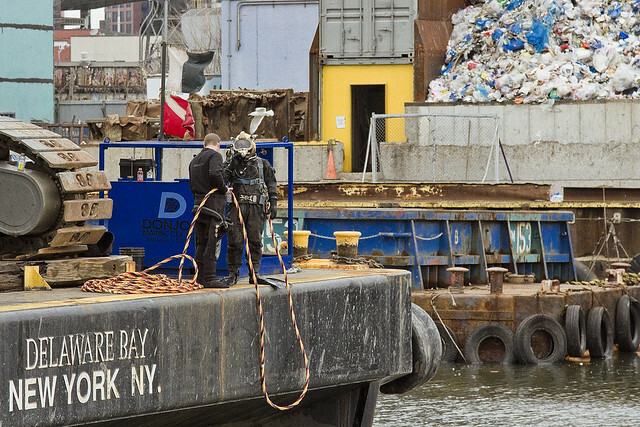 Recycling, it seems, has a centuried history along the Newtown Creek. 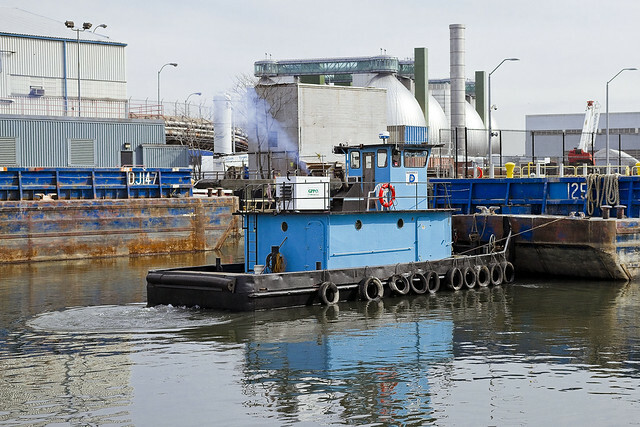 The narrowness of the great canal creates a series of issues for tug and barge combinations along the Newtown Creek and always has. 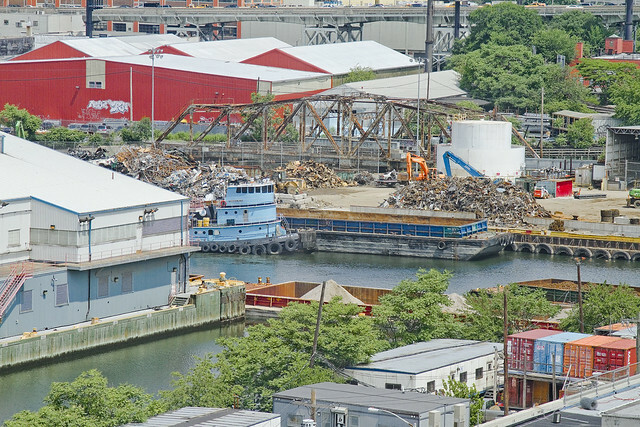 There used to be a specialist company, Newtown Creek Towing, which was located nearby the Vernon Avenue Bridge. 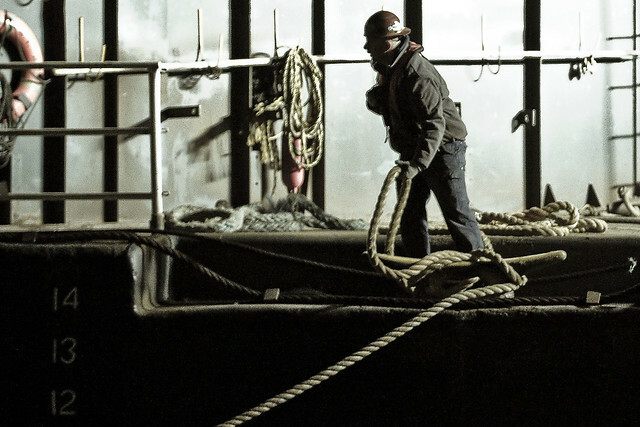 A hearty Maritime Sunday shout out to DonJon towing and the crew of the Thomas D. Witte is offered.